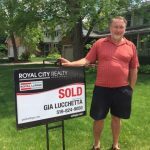 Gia Lucchetta has been helping people buy and sell homes in Guelph, Rockwood, Fergus, Elora, and surrounding areas since 1988. Born and raised in Guelph, she attended the University of Western Ontario for a degree in Geography/Urban Planning, returning as an actively-involved resident of Guelph. 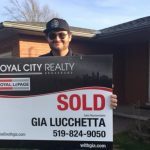 Gia is ranked in the top 3% of Royal LePage agents nationally and finds her sweet spot in the selling of heritage homes in downtown locations. Gia is proud to say that real estate has been her only employment and that she can’t imagine doing anything else. Thanks to Gia and her team for making my recent real estate experience seamless. I sold one house and bought another within 6 weeks, Gia and Charlene were there for me every step of the way. Thank you so much. I would recommend The Gia Lucchetta Team to anyone! I am completely thrilled to have worked with Gia and her team! 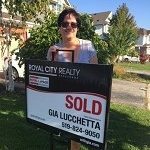 She showed honesty and professionalism from the start and shared a vast wealth of knowledge that helped to sell my home quickly. Gia's marketing skills are outstanding. 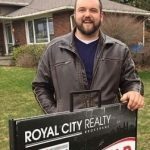 She arranged for over 40 bookings within 7 days, and because of that, we were able to sell the home for over $30,000 above asking price! A personal website was created that allowed me to view all activities on the home, from the listing agreement and advertising, to bookings with feedback - this made me feel very confident and secure in the process. Gia guided me through the process and exceeded all of my expectations! When my daughter decided to move to Guelph for school, we thought it might be a good idea to invest in the local market. Gia was recommended to us by our local agent and both her and Charlene made this long distance relationship seamless. 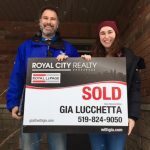 Through email, phone conversations and a couple of face-to-face visits, they were able to guide us through the Guelph real estate market and find the perfect place for us. Professional, knowledgeable, supportive and eager to help, they guided Lehna through her first home purchase and made sure that all the things that needed to be done were clearly communicated. Thanks Gia and Charlene – we’ll be calling you again when it’s time for the next move. Gia and Charlene did a great job. From Day 1, helping us to get ready to sell, recommending professionals (decorators, stagers, lawyers, etc.) preparing a professional listing package and online presence, and assisting through the negotiation phase to closing, everything was done in a highly professional, no nonsense and very transparent manner. The on-line portal really kept us in the loop, and everyone was available for regular telephone and in person updates throughout the process. We’re glad we chose to work with The Gia Team to achieve our objectives. The Gia team did a great job with the selling of my house. A very friendly staff who kept me updated daily with progress reports. My house sold in just 6 days and over asking price. I knew I was in good hands with these ladies. Saying thanks just does not seem to be enough.